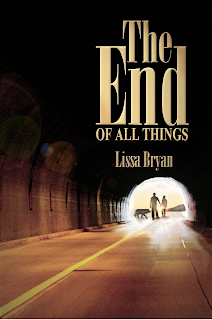 Lissa Bryan: "The End of All Things" Now Available for Pre-Order! "The End of All Things" Now Available for Pre-Order! My latest novel is now available for pre-order through TWCS! After a terrible virus ravages the planet, Carly, one of the few survivors, hides in her apartment in Juneau trying to survive the best she can with only occasional forays to gather food. She is discovered by Justin, an ex-soldier intent on making his way to Florida before winter sets in. This is the story of their journey to find a place to begin a new life, and a home in each other. You can read the first chapter here, and its reviews on GoodReads. I also gave an interview about it recently on Romance Writers of the Apocalypse. As an added bonus, if you pre-order the book, I'll send you a signed bookplate for it.